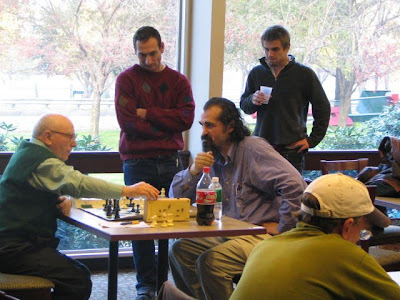 The following “research of winners of the GBO through the decades” is a follow up of a publication made by Robert Oresick and credited to MACA Publications Coordinator George Mirijanian at the Boylston Chess Club Weblog on 10/26/09. I went Thursday night to the BCF and in one hour I gathered a lot of information from our Chess Horizons collection, but sadly I found we are missing two issues from 1983 Volume 15, issues #5 & 6 where the winner(s) of GBO from that year are named. I would like to call all the readers of this weblog if anyone has and could spare such issues to the BCF to get in touch with me in order to obtain them if it is possible. I want to apologize if I have misrepresented the proper chess titles or have omitted them for these distinguished past winners; I did not pay attention to these details. Possible reviewing to newspapers in the Boston Area from 1969 to 1949 will yield more names to this list. Ethan Gilsdorf will speak about his book "Fantasy Freaks and Gaming Geeks"
Just found out about your organization. I'm a New York Times and Boston Globe freelance journalist and a PsychologyToday.com blogger --- and Somerville resident --- and I think members of your group might be interested in my new book and attending an event I'm having at Brookline Booksmith Tues Nov 3. Would you be willing to pass this on to your peeps? author of "FANTASY FREAKS AND GAMING GEEKS: An Epic Quest for Reality Among Role Players, Online Gamers, and Other Dwellers of Imaginary Realms." Ethan Gilsdorf presents his travel memoir / pop culture narrative "FANTASY FREAKS AND GAMING GEEKS: An Epic Quest for Reality Among Role Players, Online Gamers, and Other Dwellers of Imaginary Realms." The book is an exploration and celebration of fantasy and gaming subcultures. The event begins with a "geek trivia contest" with prizes that tests the audience's knowledge of all things Tolkien, Harry Potter, Dungeons & Dragons and more. Gilsdorf will then read an excerpt from "Fantasy Freaks and Gaming Geeks," followed by a Q&A and book signing. 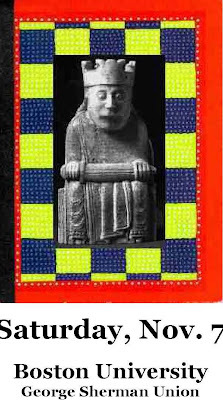 >"For anyone who has ever spent time within imaginary realms, the book will speak volumes. For those who have not, it will educate and enlighten." >"Imagine this: Lord of the Rings meets Jack Kerouac's On The Road"--- National Public Radio's "Around and About"
“A vicarious peek into an escapist pastime." Come commune with your inner fantasy fan or gaming geek with Ethan Gilsdorf, author of the travel memoir / pop culture narrative "FANTASY FREAKS AND GAMING GEEKS: An Epic Quest for Reality Among Role Players, Online Gamers, and Other Dwellers of Imaginary Realms." 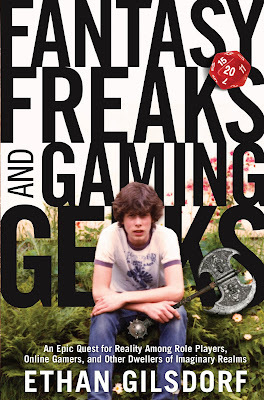 "Fantasy Freaks and Gaming Geeks" is travel-memoir exploration and celebration of fantasy and gaming subcultures. As you know, online gaming, Harry Potter and Lord of the Rings are huge and topical these days. The book is an effort to understand the appeal of fantasy and gaming. On a quest that begins in his own geeky teenage past and ends in our online gaming future, former D&D addict Gilsdorf crisscrosses America, the world, and other worlds—from Boston to Wisconsin, France to New Zealand, and Planet Earth to Middle-earth to the realm of Aggramar. He asks game-players and fantasy fans---old, young, male, female, able-bodied and disabled—what attracts them to fantasy worlds, and for what reasons. What he discovers is funny, poignant, and enlightening. After playing Dungeons & Dragons religiously in the 1970s and 1980s, Ethan Gilsdorf went on to become a poet, teacher, and journalist. In the U.S. and in Paris, he’s worked as a freelance correspondent, guidebook writer, and film, book and restaurant reviewer. 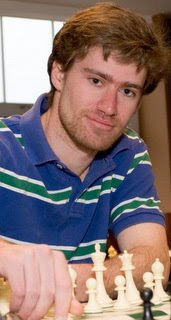 Now based in Somerville, Massachusetts, he publishes travel, arts, and pop culture stories regularly in the New York Times, Boston Globe, and Christian Science Monitor,and has been published in other magazines and newspapers including National Geographic Traveler, Psychology Today, and the Washington Post. His blog "Geek Pride" is seen regularly on PsychologyToday.com and he has also been a guest on talk radio as a fantasy and escapism expert. He does not own elf ears, but he has kept all his old D&D gear, and has been known to host a Lord of the Rings party or two. Follow Ethan’s adventures at http://www.ethangilsdorf.com. My book "FANTASY FREAKS AND GAMING GEEKS: An Epic Quest for Reality Among Role Players, Online Gamers, and Other Dwellers of Imaginary Realms" will be published September 1, 2009, by The Lyons Press/Globe Pequot Press. My book "FANTASY FREAKS AND GAMING GEEKS: An Epic Quest for Reality Among Role Players, Online Gamers, and Other Dwellers of Imaginary Realms" is now available from The Lyons Press/Globe Pequot Press. Congratulations to SM Denys Shmelov for becoming the champion of Boston. He is the latest in a long list of distinguished champions. Read George Mirijanian's full account on the MACA site News section. 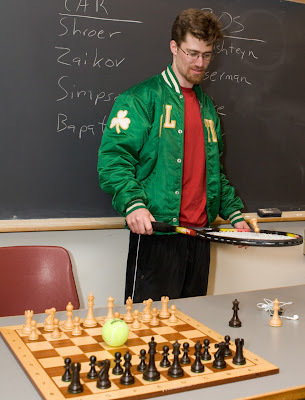 When he is not playing tennis, IM Marc Esserman serves on the new executive board of the Boylston Chess Foundation and plays for the Boston Blitz. Harare — LUNCHTIME in the streets of Harare has been spent in different ways over the years ranging from having eats, just relaxing, playing draughts, tsoro and lately computer games. A new form of whiling up lunchtime has since emerged in the form of playing chess. But the game has been taken to another level as players place bets, gambling to be precise. Although in the past cards and draughts were the in-thing, with people gambling even their bottom dollar, and in extreme cases wives, chess has recently taken the fancy of many. While it started off as a pastime to divert the pangs of hunger, with chess lovers gathering along the First Street Mall in Harare where some of the "chess boards" are still etched on the pavement today, the interest on the game has grown bigger. Some enterprising people with a mind towards "making a quick buck" are using chess to make a few dollars. The Rezende Street Bus Terminus and the pavements facing Causeway Post Office have become centres of gambling. Naturally interest in the game grows during lunch hour. Although they play the game under social guise, investigations have shown that gambling for cash was the major attraction. While some people interviewed by The Herald denied that they were gambling, street kids, vagrants and the unemployed were using the game as a way of "making a living". Those playing the game along Rezende Street said they started off as a chess club back in 2000. "We are into it on a social basis and we use it as a training ground since we don't have premises to use. "The club has been here for quite some time and if something fishy happened it could have been known by now. I think we have accommodated a lot of people who come here to play the game and leave. "We do not bet, we play the game for the love of it," said Danny Kanojerera chairman of Rezende chess club. Although there are some bona fide chess players such as Charles Kuwaza, of the Zimbabwe Chess Federation who believe in the "sanctity" of the game, investigations showed chess was no longer just a game but some form of business. While some professed ignorance over the gambling issue, others were busy staking their money against one another. Others said they were taking the game seriously like any other sport. One player who identified himself as Tariroyashe Takavarasha, otherwise known as G M Tarov, based at Rezende Bus Terminus denied they were gambling. "We have even participated at national level and at one point we were on top of the national chess league. We are operating from here owing to lack of sponsorship," he said. But one player who spoke on condition of anonymity said they were using the game to earn money. "When someone passes by and is new on the scene we throw in challenge matches. Sometimes we bet on our own in order to get money for lunch," he said. He said they can go for a US$2 bet or more depending on who will be playing, adding that games that involved money were more interesting. 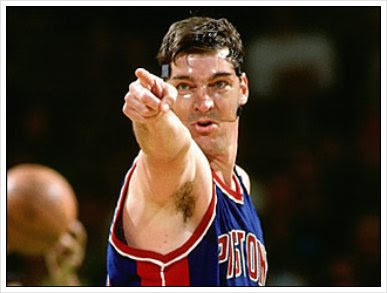 "It's more interesting to watch a game in which a person would be defending his money. If there was no money no one would come here to play the game as very few people know about the game. The nature of the game needs patience and who would wait until the game is over?" he asked. Pressed on how much time the game took considering that a single match could take hours, he said: "Since the games are not of standard form we relax the rules so that we come out with a winner. "We can also play 'time game' where we allocate time to players. Arohwa, arohwa toverenga mapiece," he said. Some players said quarrels were common, which is typical in most gambling games. "Arguments are common even in soccer or any other games. "Sometimes there are people who quarrel among themselves although we have never witnessed fistfights. "Most people are professionals and they resolve the issues professionally but when other people are involved in arguments, it will attract the attention of the general public," he said. One person who works at a shop near one of the places where the chess players frequent described them as dubious characters. "We keep an eye on these people as some of the characters that come here are suspicious. The other thing is, why are Harare City Council officials allowing them do play their games here?" 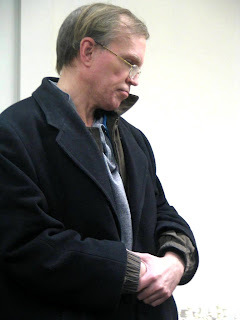 charged the man who identified himself only as Mike. 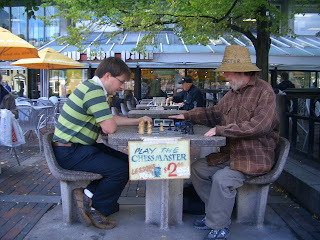 Several years ago it was a typical Saturday $10 open with the usual cast of characters toiling in the chess hall. Meanwhile in the skittles room sat director Bernardo Iglesias at the PC with Kent Leung giving a chess lesson to a young beginner. The boy's mother was just sitting soaking in the quiet ambiance of the BCF chess world. When suddenly in stormed Scott Didham who began moving pieces of a chess set with authority while talking in a loud voice at the pieces. He was criticizing himself for a series of moves and told himself never to make those particular moves ever again. Scott then quickly left. The mother had a shocked expression on her face and Kent calmly said to her, not to worry, Scott is an ok person. But it gave me room for thought about how chess players, very intelligent people, who occasionally can respond to their play results in a quirky way due to the tension and adrenalin generated in the heat of the battle. This is a byproduct of the concentration and effort used in playing. To an outsider the reactions of us nerds might be taken as eccentric behavior, but to us insiders we learn to accept these responses within reason as just part of the game. In fact most of us quite enjoy the machinations and expressions of our chess comrades. 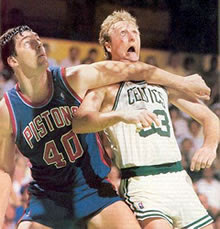 I especially love to watch postmortems and the interplay between players. There are very few things in life where we get the opportunity to reconstruct what happened and even get to pick the brain of your opponent to get their perspective. It's especially entertaining if there is a theoretical difference of opinion. There is an honesty about it all, which is very important in seeking chess truth. I always felt that the organizers of the Kasparov vs Deep Blue should have anticipated a victory by Deep Blue and realized that they should give Gary Kasparov several minutes to decompress, if he lost, before interviewing him. I though it was bad planning on their part to let him vent in public. And in my games when an opponent is not so happy for blowing their game, I give them a little leeway because I have been in that position of not taking a loss so well. Some losses still give me pain years later. Are you more accepting of a chess player's reaction to bad outcomes as compared to say a pro athlete's behavior? Where is Bill Lambeer today anyway? A few months ago, we reported here that Boylston Chess Club Board member Marc Esserman had reached the International Master title qualifications. Some people balked at the many "good jobs" and "way to gos" as premature, as FIDE had yet to officially recognize it. It is now officially recognized by FIDE. See here. Congratulations, Marc! Well deserved. Keep banging out miniatures as you do in the US Chess League, and we may soon be posting a GM notice on these pages. GMs and IMs free entry. USCF membership must be current. Partially funded by Boston University’s undergraduate student fee. ATTEND THE DENKER/POLGAR US NATIONALS !!! In what is probably a record turnout for a $10 Open, 47 players competed on Oct. 10th, among them, 28 in a very strong open section. 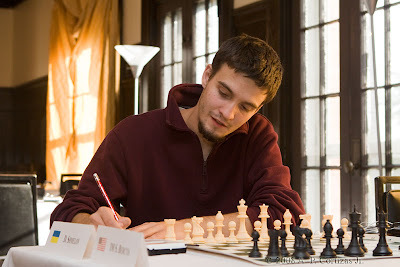 GM Alexander Ivanov and IM David Vigorito shared first place with scores of 3.5 of 4. NM Charles Riordan, Christopher Chase, Lawyer Times, had 3.0, along with young Zongyaun "Ben" Yuan - now rated 2127 after 32 rated games in the United States. Other masters in the open section were: FM Teddy Coleman, WFM Roza Eynullayeva, NM Carey Theil, and NM Chris Williams. Dustin Richwine won sole 1st in the under 1800 section with 4.0. Eric Lawless, Greg Siciliano, and Timothy Pan shared second with 3.0. Complete crosstable are available at the USCF site. 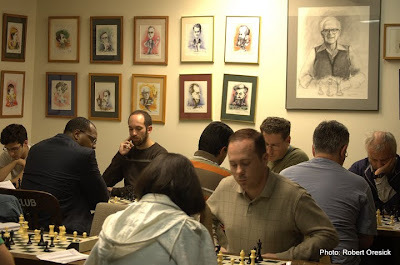 The Boylston Chess Foundation annual meeting is Wed., Oct. 14 at 7 pm. Elections for open positions on the board will be held. There is a wonderful new picture book about the history of Harvard Square. Several photos from the book are hanging in Club Passim, the Harvard Coop, and other stores around the Square. Since I moved here in 1998, that just isn't possible. I was also 7 years old in 1983. 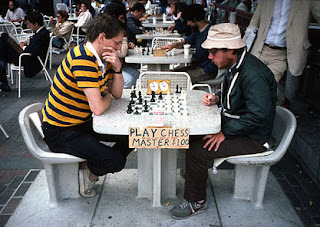 My wife suggests that perhaps I am about to time travel, but I must wonder how sad I must be if, after doing something as cool as time travel, I can only think of playing chess in Harvard Square.